The FDA’s Center for Drug Evaluation and Research (CDER) sponsored a public workshop on August 29 on “Diabetes Outcome Measures Beyond Hemoglobin A1c (HbA1c).” The landmark meeting brought together people with diabetes, patient advocates, manufacturers, healthcare providers, researchers, and policymakers – over 900 in-person and online attendees – for a lively day of presentations and discussion on the value of outcomes beyond A1c in diabetes drug regulation. The conversation touched on a range of patient-centered outcomes, focusing in particular on time-in-range, low blood sugar (hypoglycemia), emotional well-being, and quality of life. Throughout the day, speakers emphasized that A1c retains – and ought to retain – a prominent place in the evaluation of diabetes treatment success, but that it needs supplementation with other measures that round out the diverse picture of living with diabetes – an individually experienced and managed condition. Notably, FDA leaders appeared remarkably open to outcomes beyond A1c, though expressed concern about how to standardize and reliably measure such outcomes. Other major themes included the importance of considering the diversity of the diabetes population when making regulatory decisions and finding ways to use technologies such as CGM to collect data on additional outcomes. The need for collaboration emerged as a key next step, with multiple speakers highlighting the importance of advancing the conversation in future workshops focused on quality of life, time-in-range, and hypoglycemia. See below for more on the day’s presentations, including some compelling quotes from speakers throughout the day! For more on A1c and additional outcomes, check out diaTribe’s recent article on why A1c is not enough. What Did the Speakers Discuss? Dr. Francis Kalush, Programs Health Coordinator at the FDA, started the workshop asserting that, “The goal is for patient preferences to be included in the regulatory process.” Indeed, with separate sessions throughout the day featuring the perspective of regulators, patients, and industry, the meeting with filled with insights about the many ways to define the daily diabetes experience beyond the traditional A1c. The diaTribe Foundation sends enormous thanks to Dr. Kalush and her team for making this day happen at FDA and for enabling so many patient voices! 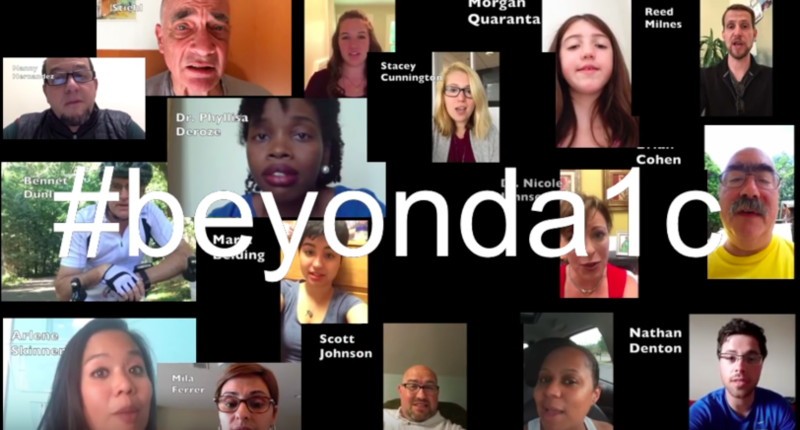 See this video to hear much more from patients across the country as they explain their biggest struggles and what they’d like to see next from the FDA. 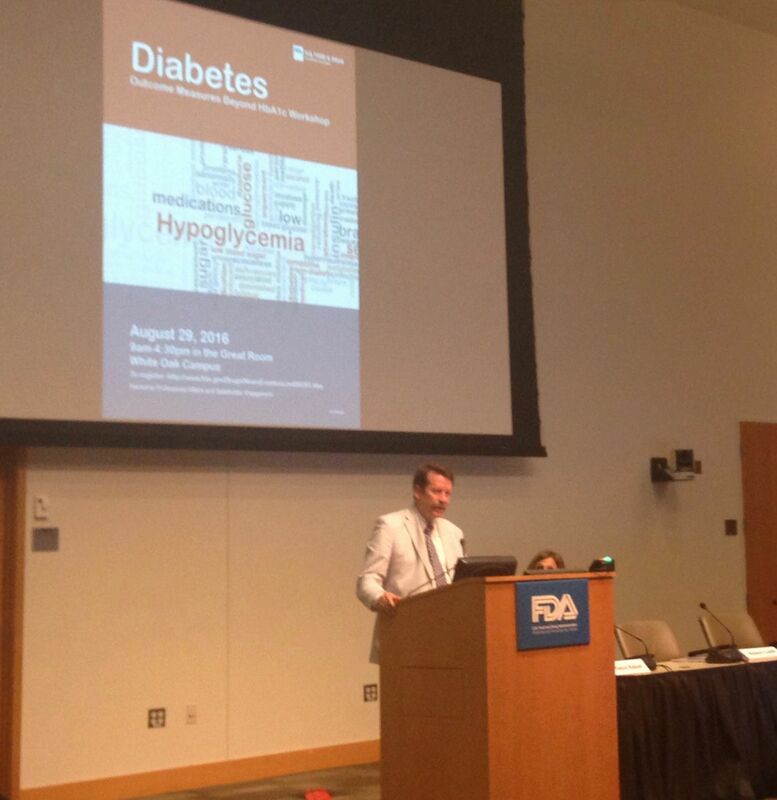 Dr. Robert Califf, the FDA Commissioner, welcomed attendees and encouraged everyone to think of ways to integrate knowledge for diabetes self-care into the overall fabric of healthcare. This sentiment, that collaboration is key, was repeated throughout the day. It was particularly moving that the top leader of the FDA, the FDA Commissioner himself, came to the meeting and spent so much time expressing his view of the importance of patient perspective. Hearing Dr. Califf, a cardiologist, it was obvious how deeply he cares about patients and how much he’d like to change the lives of people with diabetes nationwide. Dr. Jean-Marc Guettier, the FDA Director of Division Drug Metabolism and Endocrine Products, noted that clinical benefits encompass how long a patient lives as well as how they feel and function. Throughout the day, and particularly in the closing panel, the degree to which he was seeking to understand patients more was clear. Dr. Bart Van der Schueren, from the EMA (Europe’s equivalent of the FDA), offered an international perspective on the discussion, upholding the excellence of A1c as a diabetes outcome measure, but adding, “It doesn’t tell everything.” He emphasized that the EMA is in the midst of revising its 2012 diabetes drug guidance and called for global agencies to work together. He also mentioned that the EMA added mention of CGM to its guidance in 2012 and was again updating it to reflect the even better accuracy of tools today. A common theme among the FDA speakers was the need for methodological rigor in the determination, validation, and approval of new diabetes outcome measures, asking: “What should we measure? How should we measure it, and in whom? And how do we involve more people in the larger system?” These are fantastic questions that the broad diabetes community looks forward to helping answer through the combined efforts of people with diabetes, advocates, and caregivers. Dr. David Marerro, the former President of Health Care and Education for the American Diabetes Association, discussed accepted quality of life measures across the healthcare space, highlighting the wide acceptance of such measures in children. No similar measure has wholesale acceptance in adults, although measures such as the Well-Being Index (WHO-5), the Patient Health Questionnaire, and the Diabetes Distress Scale (DSS) have all been suggested, he said. Dr. Marerro (who also has diabetes) is a highly recognized leader in the field and has tremendous influence – patients are extremely lucky to have his focus on this, along with Dr. Bob Ratner, the Chief Scientific Officer of the ADA. Anna McCollister-Slipp, a patient representative, praised the strength of A1c at its first adoption in diabetes drug reviews and said that new measures ought to keep up with technological innovations. She said: “Diabetes has moved from being a death sentence to being a life sentence,” and she urged reviewers to better recognize this reality by accepting additional outcome measures for success. “The good news is that we have new technology: we have CGM, which has become incredibly accurate and very reliable,” she said, highlighting the wealth of data such devices now generate. Dr. Simon Heller, Professor of Clinical Diabetes at the University of Sheffield, at the Sheffield Teaching Hospitals Foundation Trust, UK and representing the International Hypoglycaemia Study Group, emphasized the importance of low blood sugar (hypoglycemia) as an important outcome measure beyond A1c: “Hypoglycemia is an outcome critically relevant to patients. It is a major barrier against glycemic targets, it predicts serious morbidity and mortality, and current study outcomes fail to measure its full burden.” He also spoke about the importance and high potential of other patient reported outcome (PRO) scales, such as those focusing on treatment satisfaction, psychological well being, and scales related to treatment side effects. Kelly Close and Richard Wood, of The diaTribe Foundation and dQ&A, presented survey results from over 3,000 patients (1,000-plus each representing people with type 1 diabetes, type 2 diabetes on insulin, and type 2 diabetes on oral drugs/GLP-1). The survey looked at what impacts life with diabetes. With patient preferences shining through in the numbers, Close and Wood spoke to the need for supplementation of A1c now that much better tools exist. In each group of patients, time-in-range was found to define the daily experience of living with diabetes, further characterizing the battle between two extremes: high and low blood sugar. Close mentioned the enormous time that many patients spend either in hyperglycemia (high blood sugar) or hypoglycemia (low blood sugar) or recovering from it. As she put it: “A1c is one thing; the quality of A1c is another.” Wood noted that the opinions from so many patients reinforced how much potential there is to improve quality of life forpatients and eventual outcomes. One third of people with type 2 diabetes not on insulin, he said, expressed that diabetes negatively impacted their energy for new challenges and opportunities. Nearly half of people with type 2 on insulin said diabetes prevents hem from being physically able to do what they want, he continued, and around half of people with type 1 diabetes worry about money and don’t get enough sleep. “How would you feel if you had no energy for new challenges, couldn’t physically do what you want, worried too much about money, were stressed and anxious all the time, and didn’t get enough sleep?” To view the presentation slides sharing what nearly 3,500 patients said, click here. After highlighting a host of possible outcome accompaniments to the “gold standard” A1c, such as specific, sensitive patient reported outcomes, Dr. Alan Moses, the Global Chief Medical Officer of Novo Nordisk reinforced the degree to which patients are impacted by low blood sugar, sharing data from TRIM HYPO that we be exciting to see in print! He encouraged the FDA to convene a working group to address the issues raised and provide a path forward. Dr. Moses repeatedly highlighted industry’s commitment to working with people with diabetes to address unmet needs across the physical, psychological, and quality of life spheres. In a valuable presentation, Kristina S. Boye, a Senior Research Adviser at Lilly Diabetes, offered specifics on how weight change affects diabetes outcomes, both in the long and short term. She too praised the possibilities of including patient reported outcome measures more prominently in research and regulatory review. Dr. Rachele Berria, Sanofi’s VP and Head Diabetes Medical Unit, touched upon the “wide array of stakeholders with one common goal: the wellbeing of patients with diabetes and their families.” She raised the question, “What can tell the rest of the story?” Dr. Berria pointed to several possible outcome measures in addition to A1c that would round out the picture when comparing the efficacy of different treatments. She concluded by agreeing that the formation of a collaborative task force would be valuable in working toward desired ends and asked for the acknowledgement of secondarytrial outcomes (endpoints) in diabetes research. Dr. Shana Traina, Janssen’s Director of Global Market Access, expressed her “simple wish for a complex disease: to eliminate it.” Drawing on the “unique and personal experiences of people with diabetes,” Dr.Traina spoke to the need for the FDA and other regulatory bodies to expand focus beyond symptom reduction and improvement of functioning for people with diabetes. She urged the Agency to consider broadening its interpretation of the Guidance to Industry on patient-reported outcomes to include concepts such as ease of diabetes management and treatment satisfaction. This workshop was the product of a collaboration between The diaTribe Foundation, the JDRF, the American Diabetes Association, and the American Association of Clinical Endocrinologists. It builds upon a November 2014 FDA event that brought together thousands of people with diabetes and advocates to share valuable patient perspectives with the FDA to better inform the review process for diabetes drugs and devices. Many in attendance emphasized the limitations of A1c numbers alone as the measure of success for treatment and research outcomes. Suggested supplements to A1c included time-in-range, frequency of low blood sugar (hypoglycemia), glucose variability, weight change, diabetes burden, and more. 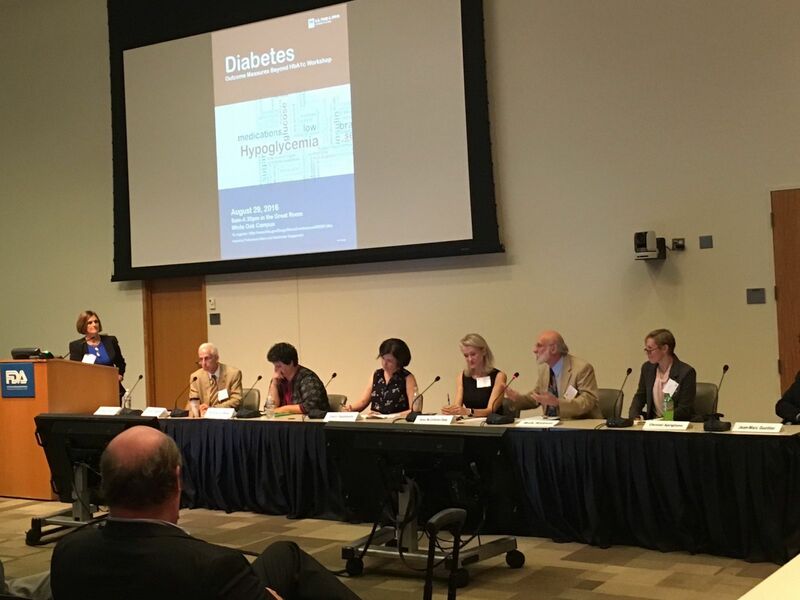 The FDA workshop on August 29 aimed to continue this important dialogue and bring patient priorities to the forefront of the FDA’s diabetes drug review process. To prepare for the workshop, The diaTribe Foundation partnered with dQ&A to circulate a survey on the priorities and metrics that are most impactful to people with diabetes. The survey received 3,455 survey responses, including 2,767 open-ended comments that have been given to the FDA. The diaTribe Foundation also shared materials with the FDA to help convey the broad range of patient experiences and to highlight the urgency of incorporating outcomes beyond A1c in diabetes therapy regulation. These resources included a 165-page booklet filled with data and patient quotes from The diaTribe Foundation and dQ&A survey – including an appendix with information on A1c and the value of supplemental outcomes – and a video filled with great clips submitted be people with diabetes (watch the video here!). Thank you to the FDA for sponsoring this important meeting and to everyone who added their voice to the conversation! Please stay tuned for updates on next steps after the August 29 FDA Public Workshop!